The study of learning and memory is a central topic in neuroscience and psychology. Many of the basic research findings are directly applicable in the treatment of diseases and aging phenomena, and have found their way into educational theory and praxis. 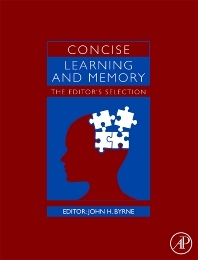 Concise Learning and Memory represents the best 30 chapters from Learning and Memory: A comprehensive reference (Academic Press March 2008), the most comprehensive source of information about learning and memory ever assembled, selected by one of the most respective scientists in the field, John H. Byrne. This concise version provides a truly authoritative collection of overview articles representing fundamental reviews of our knowledge of this central cognitive function of animal brains. It will be an affordable and accessible reference for scientists and students in all areas of neuroscience and psychology. There is no other single-volume reference with such authority and comprehensive coverage and depth currently available. Cognitive scientists, neuroscientists, neuropsychologists, and cognitive/experimental psychologists, theoretical neuroscientists, neurologists, as well as graduate students in these areas. The June and Virgil Waggoner Professor and Chair, Department of Neurobiology and Anatomy, University of Texas Medical School at Houston. Dr. Byrne is an internationally acclaimed Neuroscientist. He received his PhD under the direction of Noble Prize winner, Eric Kandel. Dr. Byrne is a prolific author and Editor-in-Chief of Learning and Memory (CSHP). "I think [this volume] is exciting and has high utility, particularly now. The field of learning and memory is arguably now the strongest example of an inter-disciplinary field within the neurosciences and psychology, and the fruitfulness of that convergence is likely to only grow in the coming years. Having one volume that ties together these elements and is up to date is very useful. The scope is impressively appropriate." "The authors represent a "who's who" of learning and memory research. It is an excellent choice of topics and exquisite selection of authors. It covers the area well, the chosen topics includes classical ones as well as hot ones." "There is a need for this book. There is no comparable book on the market. [The choice of topics is] excellent. Editors and authors are very appropriate." "This looks amazing! I want this book!"